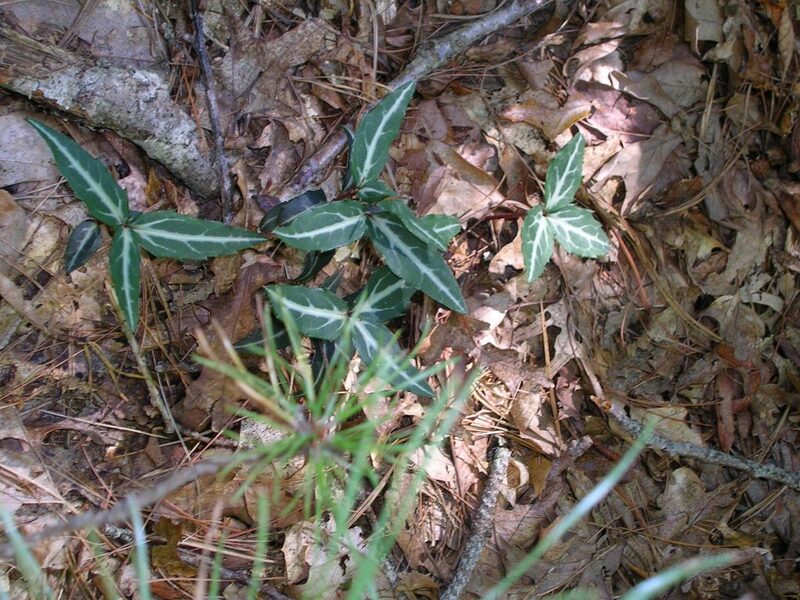 Chimaphila maculata is a perennial, evergreen, slightly woody (subshrub), stems reddish, colonial from a creeping rhizome, roots associated with specialized mycorrhizal fungi (Smith and Read 1997); flowering stem 10-20 cm tall. Leaves alternate, appearing whorled, stalk short, blade 2-7 cm long, stiff, tip pointed, base rounded, surface dark, blue-green, midrib and larger lateral veins white, margin sharply toothed. Flowers white, radially symmetrical, 1.2-1.8 cm wide, fragrant, petals and sepals 5, spreading, stamens 10, ovary superior; inflorescence a cluster of 2-5 flowers above leave, flowers often facing downwards; blooms June-Aug. Pollinated mostly by bumblebees, especially Bombus perplexus (Moore et al. 2006). Chimaphila maculata old fruit. Roxanna Martin. Native & Naturalized Plants of the Carolinas & Georgia. 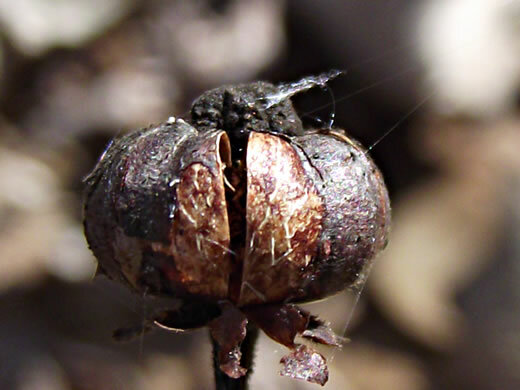 namethatplant.net (Accessed 1/2018). Habitat: Understories of undisturbed, upland oak woods in dry or sandy soil. Tolerates acid soil down to pH 3.8 (Greller et al. 1990). Found in forest soil pH 4.8-5.1 (Gargiullo unpublished data). Notes: Because of its need for specialized mycorrhizas, Chimaphila is very difficult or impossible to either transplant or grow from seed. 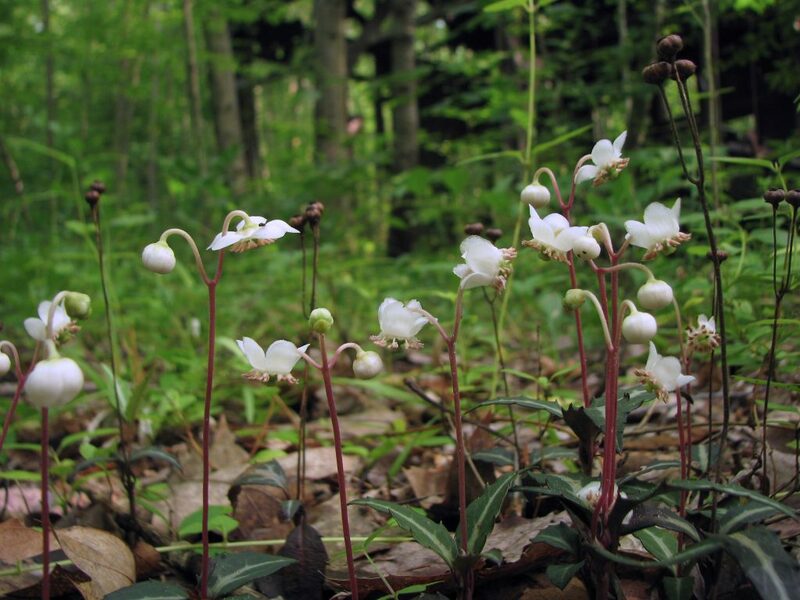 Habitat protection is the only way to conserve this plant.